In Melbourne, long before city planning regulations were set into place, houses like this Victorian took advantage and built tall boundary walls. So when the owners of this house wanted to renovate their historic home, they were able to play off the non-standard wall on the north side and build a stunning addition to their home. Maynard Architects, a Sydney based firm, set about to transform the traditional brick home and courtyard into a stunning modern home that builds upon the past while making creative use of all the available space. The main attraction of the Vader House is the center courtyard bordered on one side by the old house, and on the other side by the new extension and living space. Glass walls bring light into the kitchen and living areas while opening them up to the center courtyard, providing ample daylight for daytime activities. The new space uses two existing brick walls. 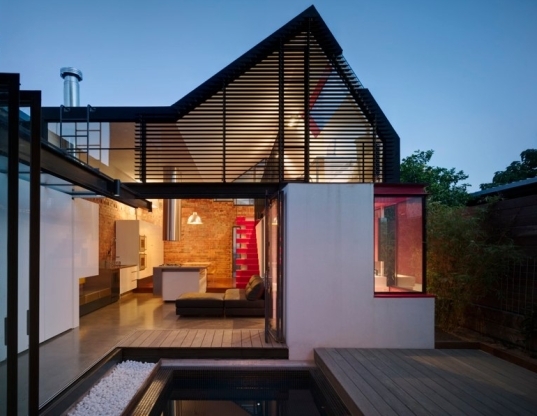 Otherwise it is constructed from new and refined materials with a sleek modern look, which contrasts nicely with the darker masonry from the old house. In the courtyard, a movable deck slides across a pool to reveal a patch of lawn. This creative use of decking, doubles the available space for lounging in the sun. Movable walls permeate the new home – the bathroom, windows, exterior doors, cabinets, all of which make good use of space in the dense inner city of Melbourne. 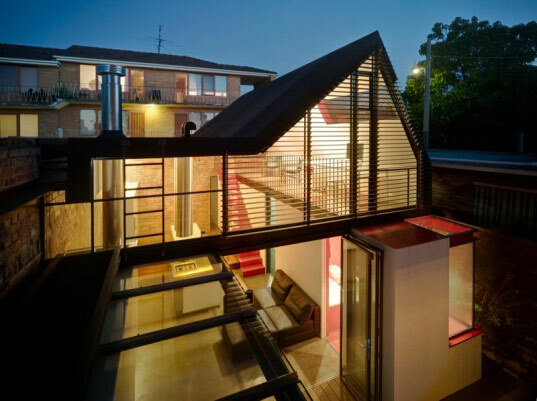 The extension has a well designed flow that makes good use of space, light and existing materials. Check out this cool SketchUp walk through of the Vader House. Not that this is especially important, but Maynard Architects are based in Melbourne, not Sydney! It is indeed a nice house. When will we all have houses that look like this?